Have you ever had your cake and eaten it too? Well, that’s exactly what Extra Magic Hours (EMH) feel like! You already have your park ticket, but as a Disney Resort guest, you’ll have the opportunity to gain access to the park one hour before or one hour after (depending on the EMH schedule) the park’s normal operating hours. With the recent opening of Toy Story Land, Disney’s Hollywood Studios has been offering EMH one hour before the park officially opens to alleviate some of the crowd traffic. This is an exceptionally great time to be a Disney Resort guest because the earlier you gain access to the park – the better chance you have of avoiding those very lengthy lines. Check out our top six attractions you’ll want to hit during EMH if at all possible at Disney’s Hollywood Studios! You won’t be alone as you dash off to Slinky Dog Dash first thing during your Extra Magic Hours. Don’t stop off for food, drinks, or photos. 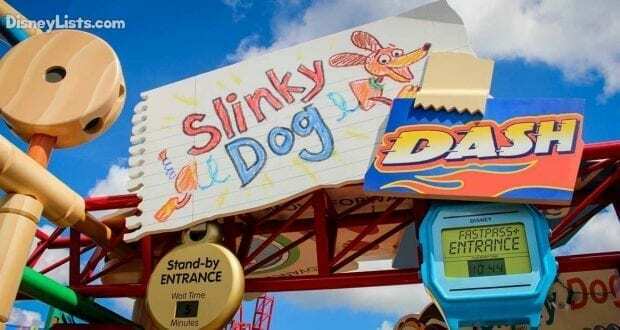 Head straight for Slinky Dog first thing to avoid the line this popular attraction creates. This is especially important if you don’t have a FastPass for Slinky Dog. But, keep in mind, even if you have a FastPass, this might be a great time to double up on your ride! It’s that good – trust us, you’ll want to ride more than once. As soon as you enter Toy Story Land, you’ll spot Slinky Dog Dash soaring through the sky on your right. While it’s a family-friendly coaster, it has enough of a kick to it that little ones that meet the height requirement of 38 inches may still get nervous. Mid-way through the attraction, Slinky Dog will take a moment to recoil himself as you shoot off for the second half of smooth riding. It’s a popular attraction alright – not just because it’s new but because it’s a blast! After you dash around on Slinky Dog, take the short walk over to Alien Swirling Saucers. Those sweet green aliens from Toy Story are ready to take you on spin. While we can’t really compare this ride to any attractions in Walt Disney World, it is just like Mater’s Junkyard Jamboree attraction that can be found in Disneyland. 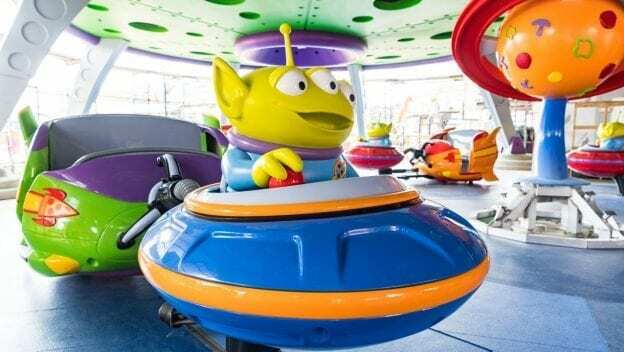 Kids and adults alike will have a fun time taking a spin in a saucer while being driven by a green alien! We think this attraction is a fun and entertaining one, but aren’t sure we would wait over 45 minutes for a ride. It’s short and sweet – perfect for Extra Magic Hours! We used to encourage people to go immediately to the fantastic attraction we know and love as Toy Story Mania. With the popularity of the other two Toy Story Land attractions above, we now recommend this to be third on the list. Toy Story Mania is a 3D attraction that takes guests through arcade-style games where shooting at targets earns you points during a fun and exciting ride! The entrance to Toy Story Mania was moved to Toy Story Land upon opening which makes for easy access during Extra Magic Hours, after riding Slinky Dog Dash and Alien Swirling Saucers. Get ready to let your competitive side out! Never would we have thought Rock ‘n’ Roller Coaster Starring Aerosmith would be in the 4thposition to try to tackle during Extra Magic Hours, but obviously Toy Story Land has changed the crowd flow. While it’s much easier to get a Rock ‘n’ Roller Coaster FastPass since it is now a Tier 2 option, we still recommend trying to arrive for this coaster earlier in the day. If you notice the lines getting lengthy or if you don’t have a FastPass for this one, you may want to consider using the Single-Rider line. It moves fairly quickly – just be aware you likely won’t get to ride with your party. Be prepared to hold on tight as you rock out from 0 to 60 miles per hour in 2.8 seconds and head straight into loops and turns! At this point in time, you’ll likely be outside of the Extra Magic Hour window if you plan to do all of the above. That doesn’t mean however that you should stop moving through the park to conquer the popular attractions left! At the end of Sunset Blvd (and just across from Rock ‘n’ Roller Coaster), you can’t miss the ominous Tower of Terror beckoning guests to take a ride of a lifetime in a haunted elevator. Yes, Rock ‘n’ Roller Coaster is a thrilling attraction, but Tower of Terror is the kind of thrilling that gives you goosebumps! The line here move quickly in the morning hours, but as the afternoon approaches it can get rather long quickly. Get ready to hold on tight as you plummet down, then shoot back up on repeat in your creepy elevator! You’ve wrapped up Toy Story Land and Sunset Boulevard attractions – now it’s time to have a little fun in the Echo Lake portion of the park! Star Tours – The Adventure Continues is a Star Wars fan favorite with its 3D Motion Simulator, making it feel like you truly are soaring through space with unexpected Star Wars lands and characters around every corner. The best part is that each ride on Star Tours can be a different experience. With multiple scenarios, you’ll be surprised at which adventure you may become apart of. This is a popular attraction as the day moves on, so ride it early if at all possible. We may have come to the end of our Extra Magic Hour attractions at Hollywood Studios, but there are still plenty of attractions and shows you don’t want to miss! We hope if anything, you’ll see the perk here of being a Disney Resort guest to take full advantage of Extra Magic Hours when offered.